Internet-based bike-sharing is gaining more popularity in Chinese cities for being a convenient transport for short-distance trips. But the sudden increase of these bikes is also causing mounting pressure on urban management. 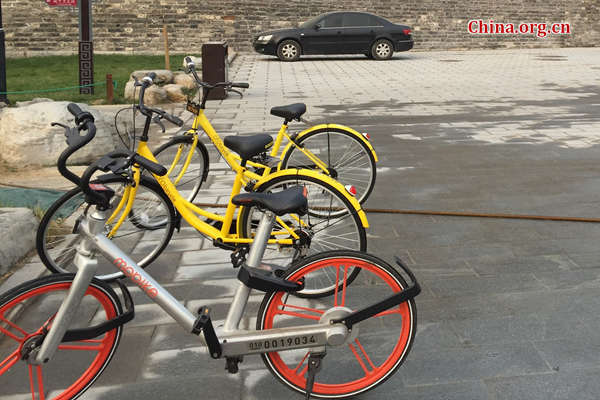 In an ordinary parking lot in Shanghai's Huangpu District, around 50 orange Mobikes are chained together alongside a couple of yellow Ofo bikes – both are leaders of web-based bike-sharing services in China. The place is an impoundment lot. A man calling himself Leo and working at the operation department of Mobike Company came to learn more about this batch of impounded bikes when he was told by the lot's meter man that parking violations might be the reason. Leo has contacted traffic police more than once to reclaim Mobikes impounded for various reasons. Parking violations are the most common reason, followed by violation of traffic rules. Traffic accidents involving disputes, though fewer in number, also cause serious trouble, he said. "Many streets in Shanghai ban cycling. Some streets don't have bike lanes, and others are one-way lanes. Running a red light happens to our Mobike user, too," said Leo. For example, the Bund is among the places that have banned pedaling or parking a bike. But many cyclists either do not know the regulations or break them knowingly for convenience. In a larger picture, these traffic violations may also be caused by the "poleless" operation mode adopted by most web-based bike-sharing services. Mobike does not set up parking places to leave more liberty to users, contributing to its prompt success. But as a byproduct of the liberty, such illegal parking will disrupt urban traffic. Fining the rider or impounding the vehicle are the two common forms of punishment that traffic police officers in Shanghai issue. But since Mobike riders only have the right to use – and do not own the bikes – so who should be responsible for traffic violations? Most Mobike users who broke rules chose to let the bikes be impounded and then instantly drew off the deposit from their personal Mobike accounts, evading responsibilities. But for Mobike, impounded vehicles means less bikes in circulation and less Mobikes mean less profit. "Mobike is actually willing to pay the fine for its users to prevent the vehicle from being taken away by police. But this apparently won't solve the problem since the fines are endless," said Leo helplessly. The market for web-based bikes still seems far from saturated. Mobike drastically increased its supply of established orange-colored bikes while introducing the new, blue-colored racing bikes, trying to gain an upper hand in the fierce competition. With the expansion, Mobike and its peers are becoming a more pronounced problem for urban and traffic management. Police officers at Shanghai's rail traffic station said that metro stations' surrounding areas are where illegal bike parking is a serious problem, given that the web-based bikes for share target the "difficult last kilometer" of a commuter's trip. "Some citizens rode bikes here but couldn't find a place to park at the lot for non-motor vehicles. Some just parked their bike right by a metro station entrance," the officer said. Traffic police authority in Shanghai said it has contacted several bike-sharing companies, requiring them to discipline their users, especially in terms of parking bikes near metro stations. For the police regulations, Mobike showed its compliance, saying that the company is grateful for the police's attention and efforts to solve the "difficult last kilometer" issue. Ofo encourages citizens to share their own bikes and compensate them with lifetime free use of Ofo bikes, participates in the government's plan to recycle scrap bikes and deploys its bikes for share based on big data analysis. Bike-sharing represents an innovation. When it tries to merge into the established social norms, conflicts arise naturally. From a technological point of view, bike-sharing companies are unable to monitor users' behaviors. They can at most step up efforts to lead users morally. But still, these efforts cannot solve every problem immediately. In their turf war for market dominance, these bike-sharing companies do not only contend for more users but also for physical public spaces. It is only expected that urban management authorities will inevitably intervene to obtain a larger say. Hence, before Mobike and Ofo want to expand, they'd better have a clear plan. Internet-based bike-sharing is gaining more popularity in Chinese cities. But the sudden increase of these bikes is also causing mounting pressure on urban management.